I like to play in the intersection of words, art and commerce. PartyHatsForGrownups.com sells well-designed party hats. Video by The Daily Dot. 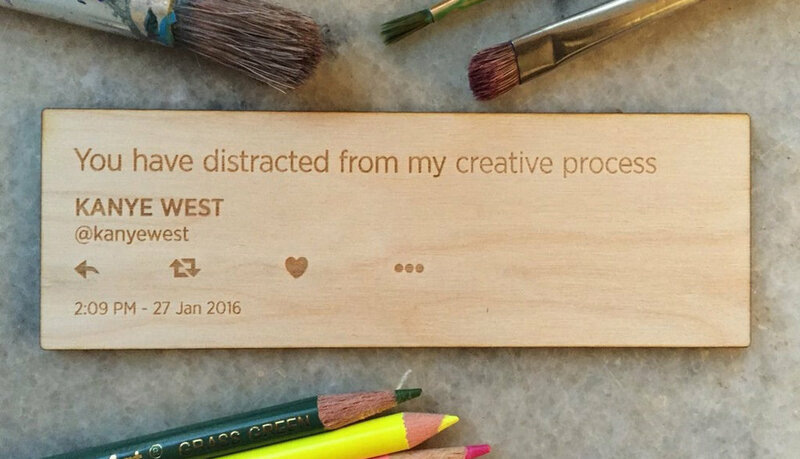 Permanent140.com turns digital tweets into physical works of art. It has been honored by The Webby Awards and featured on Swiss Miss, Side Hustle School, PSFK, Design Taxi, and more. My first art show explored the theme "Use Your Fear As Fuel." Attendees burned their greatest fear in a fire pit. Thanks to a successful Kickstarter, Passive Aggressive Notepads can solve your most annoying problems. After the Kindle launched, I sold eBook Safes that hid them inside of real books. They were featured by The New York Times, Gizmodo and Boing Boing. I created a line of Valentine’s Day cards for friends who don't like Valentine's Day. There’s still a box of them in my attic if you want one. In 2005, I sold everything I owned on eBay. AllMyLifeForSale.net examined how identity is shaped by objects and brands. By telling the story of each item and selling it to the highest bidder, its true emotional and financial value was discovered.